Tamil talkie has celebrated 75 years of its Existence last year and Sun TV screened a host of great classics in view of this,last year.I attempted to identify certain dominant phenomenons in our cinema during this 75 year old history. 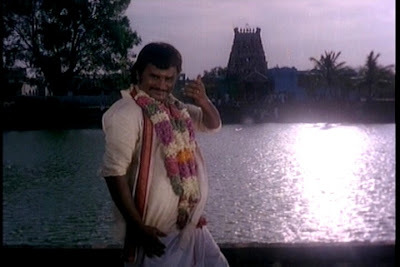 This account by me might not be a comprehensive one keeping in view that the cinema of a period is largely driven by the socio-economic and political scenario of that period and the expectations of the audience.The following write-up is just an extrapolated interpretation of my understanding of tamil cinema and is sure to have quite a few shortcomings. 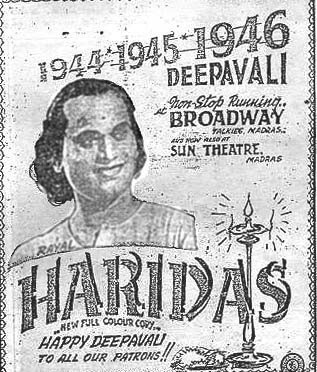 Pre-independence era saw movies being used for the propaganda against the British imperialism [Haven't seen any of them...but hearsays and literature say so].Also,we get to see a lot of films in which Gods/dharma up against the Asuras/Adharma.In simpler terms,the films of this period are just minute extensions of the stage-plays and they were absolute dramas.Lengthy dialogues & loud deliverance of the lines and a huge number of songs are characteristics of the Pre-50s cinema. MKThyagaraja Bhagavathar,KBSundarambal and PUChinnappa are considered notable actors of the era.Tamil Cinema's first known comedian NSKrishnan and his wife TA Madhuram gave socially important messages with the comedy tracks.Thyagaraja Bhagavathar's (MKT) "Haridas" successfully completed three diwalis in the Chennai Broadway Cinema hall and MKT is widely regarded as the first superstar of Tamil Cinema. 50s were a period of social renaissance and the Dravidian movement grew leaps and bounds in stature and political satires are a characteristic of 50s cinema. "Parasakthi","Manohara","Naadodi Mannan" are a few important films on this regard.These films are sensational hits and elevated Kalaignar Karunanidhi,the dialogue writer to a superstar status. 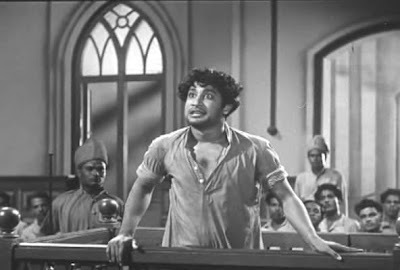 "Parasakthi" marked the entry of Sivaji Ganesan and its courtroom sequence is still remembered for its fiery and satirical dialogues. Dialogues got their due importance only after Kalaignar happened to the tamil cinema.Annadurai and Kalaignar,both gifted writers and orators took tamil cinema and politics to great heights and used Cinema as a party propaganda vehicle with astounding success. 60s saw cinema out from all its traditional shackles and directors like Sridhar delivered some of the great romantic flicks.50s and 60s films had some great film stars like Sivaji Ganesan[Played a variety of roles],MGR[Saviour of the down-trodden and poor - Robin Hood] and Gemini Ganesan[Kaadhal Mannan...I need not substantiate].By the end of 50s,Sivaji Ganesan has left DMK and presented himself a congressman.There after he started portraying several historical characters in films like like Veerapaandiya Kattabomman, Karnan,Thiruvilayadal,Saraswathi Sabatham etc. Perhaps the most important political event of the decade should be Anti-hindi agitations of 1965.Anti-congress slogans were getting stronger in Tamilnadu and DMK capitalised the issue and came to power in 1967.One more important thing that contributed to DMK's stupendous success in the 1967 assembly elections is the sympathy wave,as MGR was shot in the throat by MR Radha. Late 60s and 70s saw K Balachander breaking a lot of Cultural taboos in his cinema.It is widely considered that KB brought back the days of tamil drama into the tamil cinema.But nevertheless,we had a lot of great talents making their way into the tamil cinema in his films.Nagesh,Kamalhaasan and Rajinikanth to name a few. 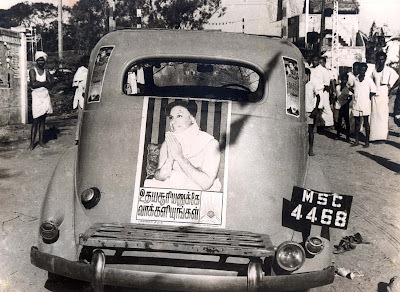 Early 70s marked the fag end of the career of MGR as he became the Chief Minister of Tamilnadu in 1977.As MGR left DMK in 1972 and floated his party ADMK,his films of this period 1972-1977,cemented his saviour of the poor image and also questioned the atrocities committed by the ruling party,DMK.The trend of caching in on the image of an actor in films,that we see in most of Rajini & Kamal movies these days has been set by MGR.The songs of "Naalai Namadhe" and "Idhayakkani" literally spread ADMK's political aspirations,capitalising the halo of the party chief,MGRamachandran. 70s are a period of political turmoil and chaos in India as this period coincides with the Emergency and the restlessness and hatred of the people on the then Indira Gandhi's government can very well be observed in films like "Varumayin niram Sigappu".So,"the angry young man" character represented the anguish of the people on the government.Amitabh Bachhan portrayed this image in his films with an effortless ease,thanks to his tall and rugged persona.The ill-effects of emergency are not felt much in the south,but when Amitabh's movies were remade in the south,Rajinikanth with his rough looks and dark skin portayed those roles quite brilliantly and became an Image of this phenomenon. 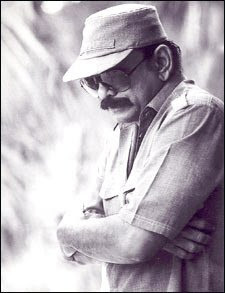 In a pure cinematic sense of Technical excellence and absolute creativity,Late 70s are a golden era for tamil cinema.This period saw a gush of young blood like Mahendran, Bharathiraja,Bhagyaraj,TRajendar,Balumahendra and Rudhraiah who took cinema to the next level.Mahendran popularised the idea of films being inspired from short-stories and novels and his "Udhiripookkal","Johnny" and "Mullum Malarum" garnered wide critical reception and great commercial attention. "16 Vayathinile" by Bharathiraja is considered the first film shot outside studios.Sensible film making with beautiful photography amused the audience as Balumahendra wrote,handled camera,edited and directed his films with sheer excellence. Mid 80s had liberal cinema and films are no longer used for political propaganda and absolutely no constructive issues are dealt in films.Films begun to be looked at as full-time entertainers.The concept of masala films is originated by MGR through Enga veetu pillai,Engal thangam,Ulagam sutrum Vaalibhan etc.The baton was carefully relayed to the next generation actors Rajinikanth and Kamalhaasan.If Murattu kaalai and Sagala kala Vallavan haven't happened for Rajini and Kamal respectively,the fate of these actors and the tamil cinema as a whole would have been different. 90s are a liberal period and 90s saw India opening itself economically via globalisation.So,society is not the villain any more in films and Dons,Rowdism,terrorism are to be fought by the protagonists.Mani ratnam happened to Indian cinema through "Roja" and he quite boldly dealt with a lot of controversial subjects in Bombay,Uyire,Iruvar,Kannathil Muthamittal etc. And,people are no longer satisfactorily entertained by south indian women.Gone are the days of Sridevi,Revathi & the like and Khushboo became a sensational success.Aishwarya Rai and Priyanka Chopra first acted in south India before pulling it off big in the Bollywood.This saw a host of North-Indian women imported for lip-moves and hip-moves.The role of a heroine has been cut-short terribly and her role is to dance with the hero for three duets in skimpy costumes.One rain song or swimming pool or beach sequence or bath tub is made compulsory.Simran,Jyothika are extremely successful after a series of exploitative roles in the beginning of their careers. Late 90s and Early 2000s again saw a new wave with a lot of youngsters like Bala,Ameer,Cheran and Mishkin involving themselves in quite a few creative and quality ventures among the so-called commercial trash.Tamil cinema technicians are world famous...ARRahman,Santosh Sivan,Thotta tharani...to name a few made giant strides in their crafts. So that was a miniaturised history of tamil cinema in my viewpoint and now comes the all important task of identifying our Dominant phenomenons in our Cinema through these years. Hope I have convincingly went through the history of our Cinema. a very comprehensive essay packed with facts and figures.... a great attempt to summarise the ocean of Tamil cinema.